1. 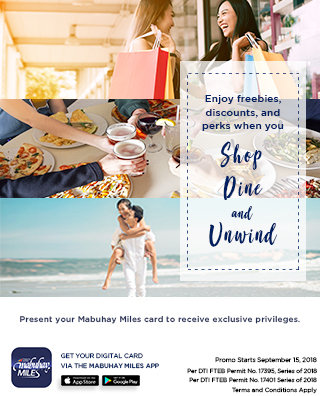 Promotion is open to Mabuhay Miles Classic, Elite, Premier Elite, and Million Miler members. 2. Discount can be availed from March 20, 2019 to December 31, 2019 only. 3. Travel period is from March 23, 2019 to March 20, 2020 only. 4. Click here to view the list of tours. 5. Mabuhay Miles members must quote the dedicated promo code to avail of the discount. 6. Not valid in conjunction with any promotions and discount offers. Per DTI-FTEB Permit Number 5594, Series of 2019.